Have you ever sat in a room full of people and wondered if or how you might be related to those around you? If not, you will now . . . Sorry. But, there is good news! 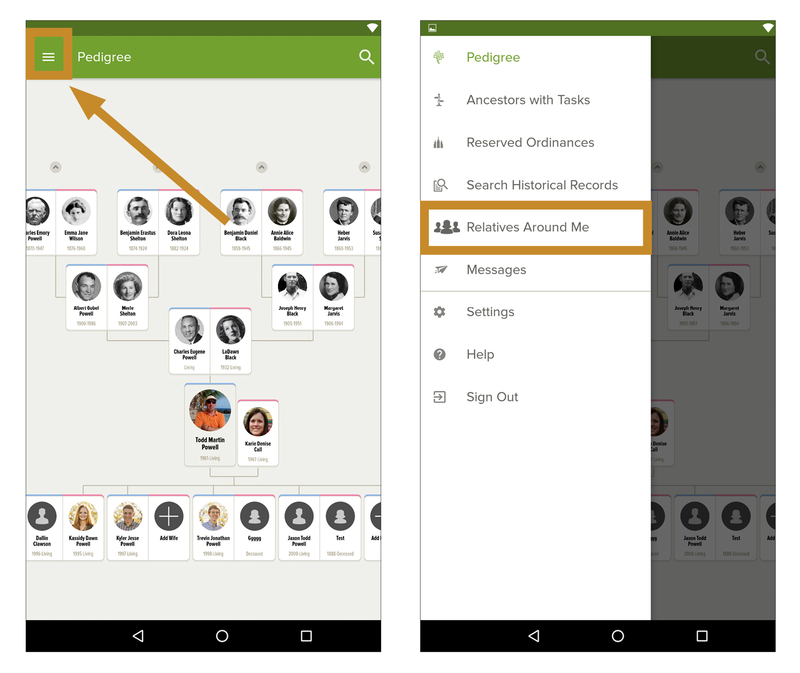 Relatives Around Me, a new feature in the FamilySearch Family Tree app, can tell you the answer. To try the new feature, you and your potential cousin both need to be signed in to the Family Tree app and within approximately 100 feet of each other. Once signed in, select More at the bottom right of the screen (iOS) or the dropdown in the top left (Android) and then select Relatives Around Me. This opens a page with a green button that says Scan for Friends. How to use Relatives Around Me for iOS. How to use Relatives Around Me for Android. Tap the green button to start scanning. Anyone signed into the app and within range will show up in a list on your device, and you will show up on theirs. Selecting the person’s name will bring up a pedigree graphic showing your common ancestor and the lines through which you both descend. Pretty cool, right? Church group—Find out who in your congregation is also part of your family tree. Fun at a weekday party or activity, and useful in a Sunday class. Friends—Out with friends? Check to see if you are related. You may have more in common with your friends than just hiking, reading, or a love of adorable cat videos. Neighbors—Easy to do as you talk with neighbors across the fence. Interesting to see if you have flocked to the same area as your distant relatives. Coworkers—A fun work party activity, or a unique way to build unity and connection among those that work in the same office. 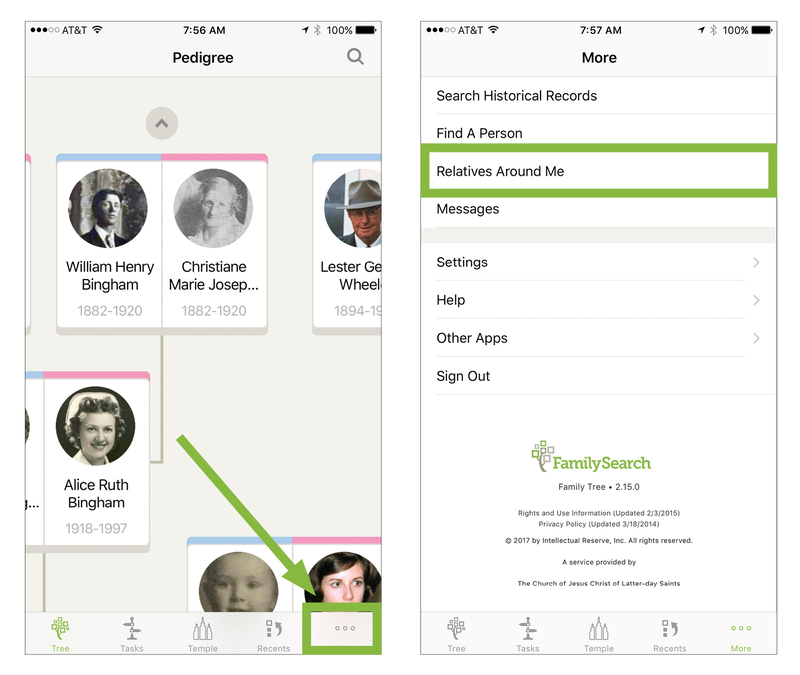 If you have questions or comments about this or any other feature of the FamilySearch Family Tree app, you can select Give App Feedback on the Help menu to send us your input. We’d love to hear what you think of the app. Download the app today and give it a try! To get to the Android app instead, click here. Relatives Around Me will not scan.